Are you looking for original inexpensive gifts? And yes, as a shopaholic myself I think that it also counts if that gift is for yourself! Well do I have a great place for your to buy said gift-Izzys Place. 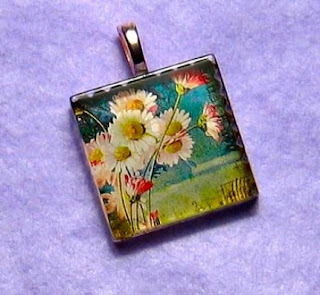 Izzys Place, owned by Pat, on Etsy is a shop specializing in glass tile, altered art pendant necklaces. Each necklace comes with a free 24 inch silver plated ball chain and gift box. Pat is also throwing in free shipping! Gift giving couldn't get any easier than that! 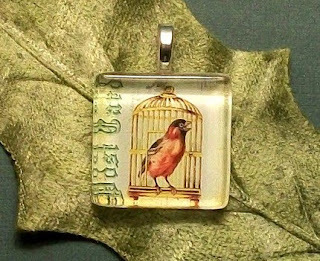 This vintage bird in cage pendant is made using 7/8” Clear Glass Tiles. Note that this is the same size for the other pendants featured here as well. Don't these beautiful wild flowers make you long for spring? Oh for the dreary days of winter to be gone! I love the modern look of these color blocks. The variety of colors used in the pendant also makes it wearable with so many things. The contrasting colors of the pink and blue butterflies give this pendant such visual interest. So here is the part where I usually post the weekly giveaway and you all enter to win. This week, as you can see, there is no picture for the giveaway. Am I holding out on you all this week you may ask? Of course not!! This week you choose your gift! That's right. If you are the winner this week you can choose any item from Izzys Place as your prize. 1. Check out Izzys Place and tell us about your favorite item there. Make sure to check all of the pendants out since you may be winning one! This week entries will be taken through Saturday, since I know many people will be busy with festivities! 2. You also receive a second entry for being a follower on my blog. 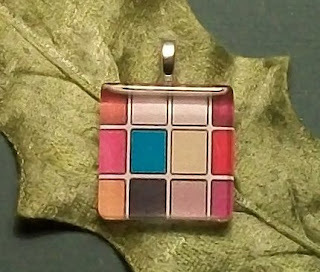 I like the modern squares pendant. 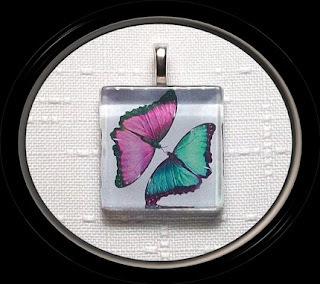 I love the pendants that are on your blog though, especially the butterflies!